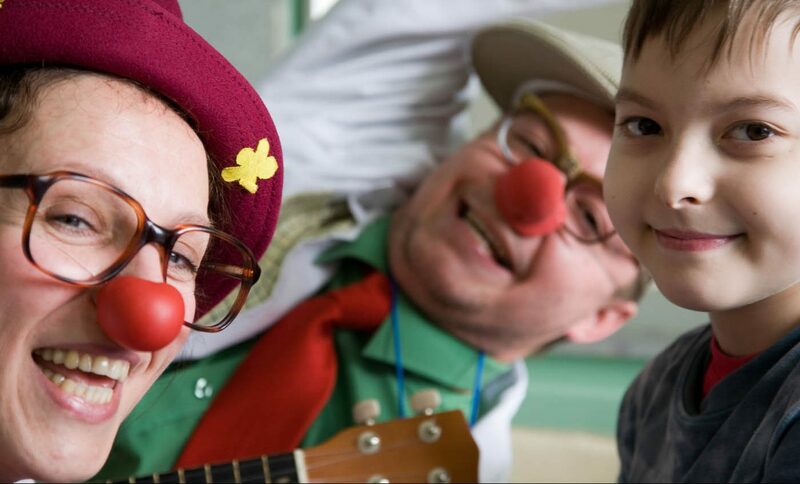 Clowndoctors bring the medicine of laughter and happiness to sick children and seniors. In this manner, they help provide relief from difficulties associated with sickness or old age, and they can reignite the spark in everyone’s eyes. Read here how they do it. Taking on the role of “clowndoctor” is never going to win an actor an award for Best Actor. It’s mostly about improvisation while building on the actor’s own intuition. The actor gets no guidance from a director but must find the right character for his or her own clown, and in the end there is only a costume and name to build from. And, of course, there is the audience. 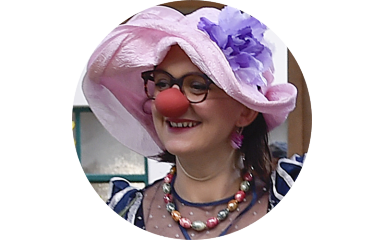 In fact, the clowndoctor doesn’t know much about what to expect until the very last moment before walking on stage. 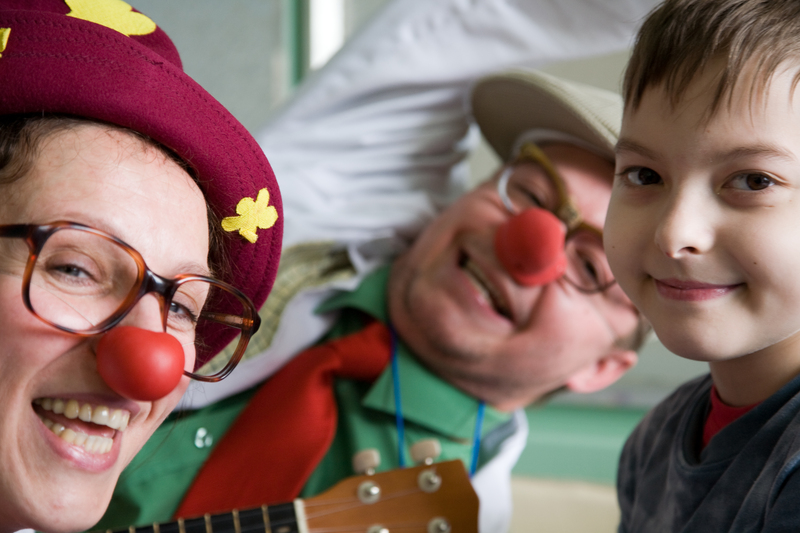 As soon as the clown dresses into the costume and tops off the whole disguise with a red nose, he or she is ready to take the stage – that stage being a hospital room. Before the door opens, the clown must disinfect his or her hands and all the props brought along for the show. In the meantime, the hospital staff provides a quick briefing about the audience. 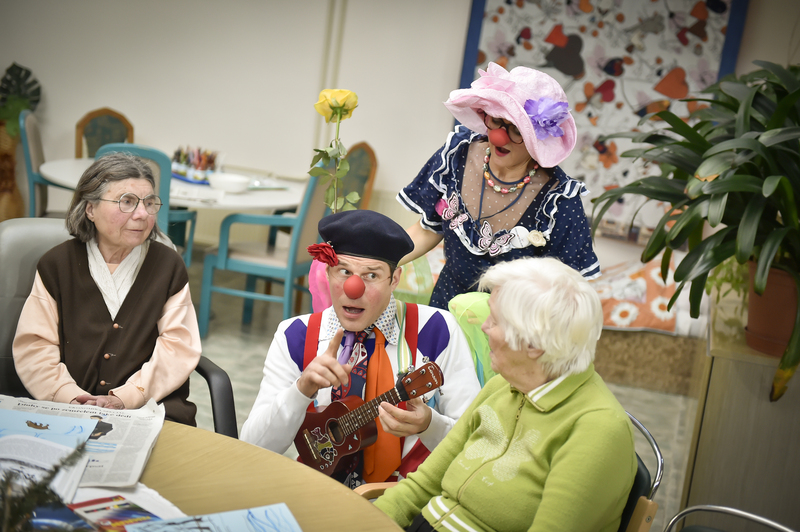 This is immensely important for the clown, who needs to know about the condition of the little patients in order to choose the right intensity for the show. 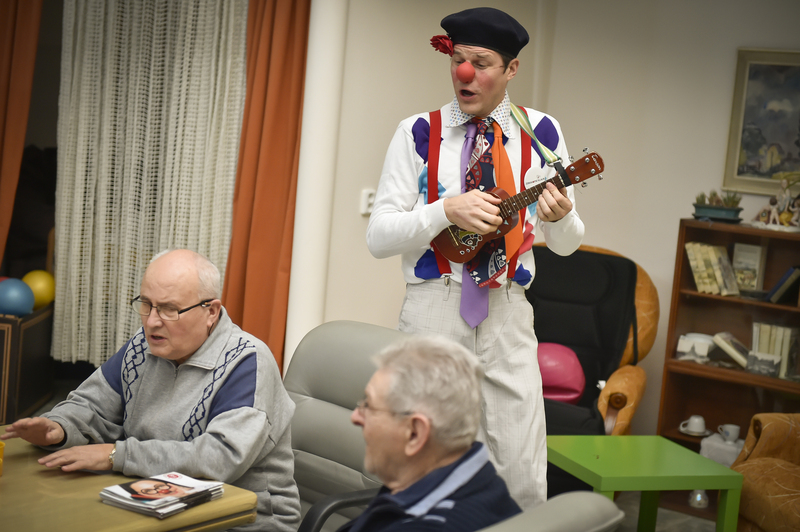 Even though laughter heals – and that is the whole idea behind clowndoctors – excessive tickling of the funny bone after, say, an appendectomy could do more harm than good. Just open the door slightly and peek in carefully. Quickly analyse the situation. That’s maybe the most difficult phase for the red-nosed actors. They don’t know in what mood they’ll find the little patients. Luckily, the clowns always work in pairs so they can support one another. It’s not their goal to storm the stage like a hurricane, but rather to make an entrance as light as a breeze that first soothes and lifts the patient’s low or gloomy spirits. 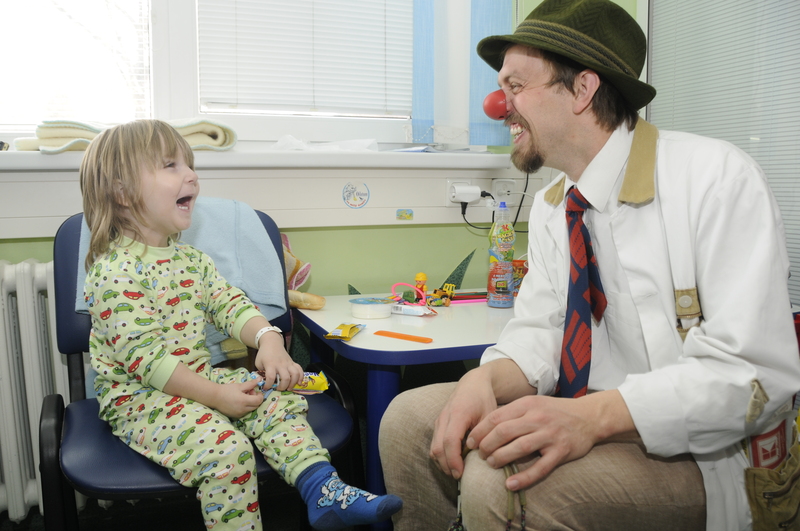 Then, once the audience has fully accepted the actors, a gust of joyful emotions can whoosh across the hospital room. “We never try to push it. The first encounter with the children is a very fragile moment, and we have to respect their mood at the time,” explains one of the seasoned clowns. They also know that, sometimes, children like to make a little fuss and pretend not to like intruders from the outside. But that is only a part of the kids’ tactics. “If that happens, we use our pretended ‘slowly breaking in’ the door trick. Works like a charm!” the clowns agree with a smile. In the majority of cases, though, the little ones impatiently await the clowndoctors’ visits. The scene is set and nurse Dull and doctor Mattock can play out their parts in full. The audience welcomes them wholeheartedly and the stress caused by an unpleasant illness or the boredom of a sterile environment during a drawn-out hospital stay vanishes without a trace. What takes its place is an experience of pure joy that will resonate with children for a long time. For many a little patient, the clown is the only link to the outside world other than his or her parents. 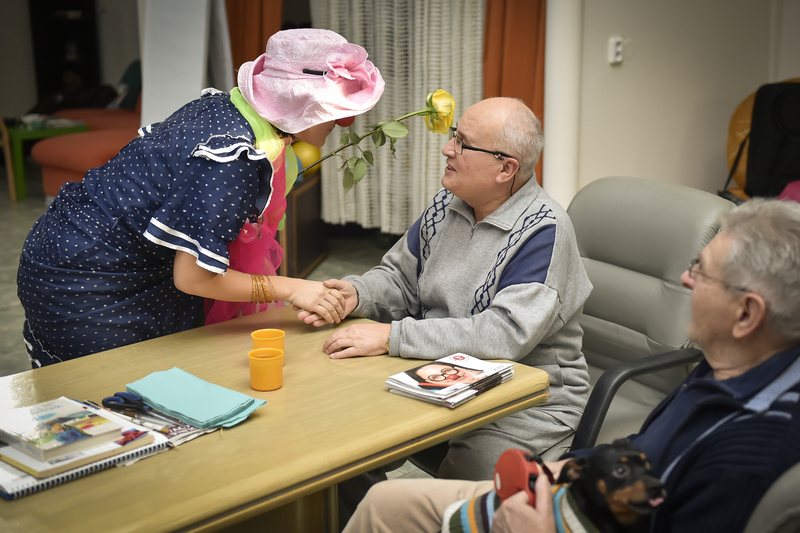 “Those who are in long-term care are basically living in the hospital environment, which is sterile and consists more or less only of commands like ‘we’re going to take your temperature… it’s time for your shot… let’s go to the toilet now… now, get some rest…’. The patients have no possibility to decide anything for themselves, they lose contact with other kids and with childhood generally, and that is extremely challenging for a psyche that is still just developing,” one of the clowns explains. That means the clowns have their sights set on health and not illness. It’s as if they don’t even pay attention to the sickness in the room, and their acting performances seem momentarily almost to chase all negativity out the door. Clowndoctors oftentimes are at work even outside hospital rooms. When some little patient is awaiting surgery, these moments tend to be accompanied by fear. On top of that, the child is hungry and thirsty. That would be enough to make anybody cranky. It’s at these times that the clown’s role is especially beneficial. The clowns are waiting for the patient as soon as he or she comes through the hospital door, and they go straight into amusement mode. From that time on, they don’t leave the ill child’s side – not even for a moment. Along with the parents, they remain with them through the pre-operative examination and then accompany the child as far as the door of the operating theatre – a place where not even parents are allowed. See you in a minute, ok? The clown costume, along with the essential red nose, serves as a certain kind of immunity for its wearer. In the spirit of good fun, they can get away with almost anything. 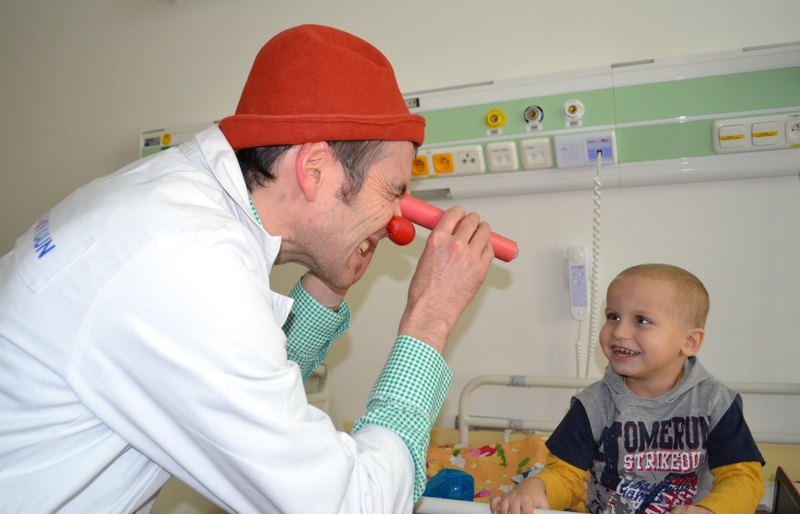 To make a child laugh, they even can poke fun at the doctors and nurses. After all, in their strenuous professions, a little laughter can bring them some welcome relief. Known in Czech as the NOS! project (the letters N–O–S being an abbreviation for the words “to the operating room”), this strategy results in an almost total elimination of fear before surgery and, oftentimes, ends with a smiling child calling, “See you in a minute, ok?” This helps not only the child but all those involved. “It’s not just a relief for the patients themselves, but also for the whole medical team and, of course, for the parents. 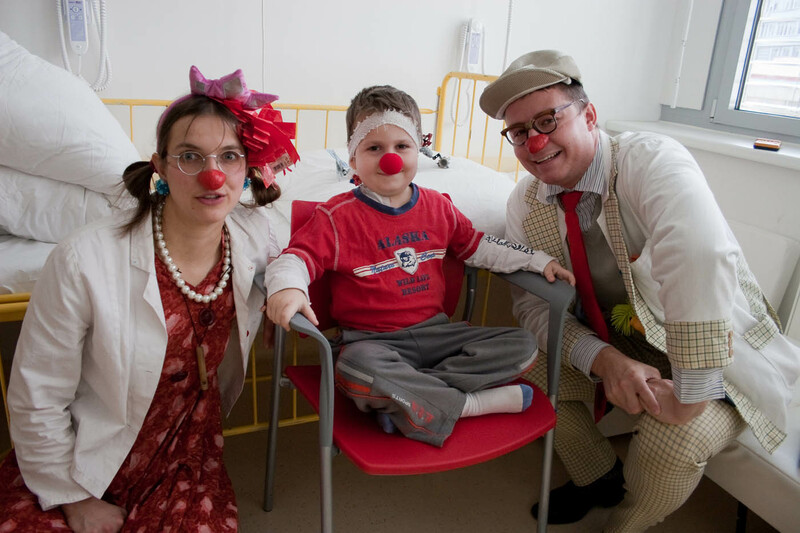 The surgeons can fully concentrate on the procedure and mothers and fathers are almost completely freed of the fear that can be transferred onto them by their overly anxious offspring,” one of the organization’s representatives explains of the clowns’ therapeutic effects. 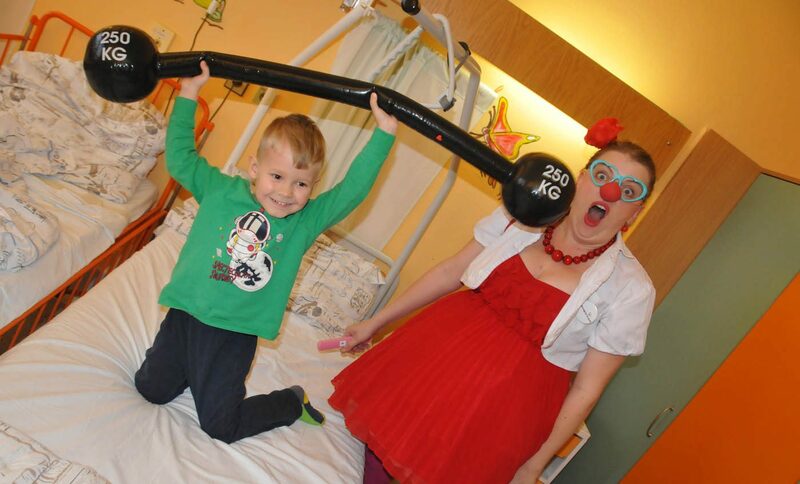 The paediatrics ward visit leaves many impressions and interesting experiences. Most surprising of all is that “eureka” moment when you realize that you can discover a similar clown within yourself. You can “pull it up” from your inner self and use it during those more difficult moments in life when you find you need not give in to the fear that often accompanies them. That, by the way, is the basis for the philosophy of Gary Edwards, founder of the clowndoctor project. 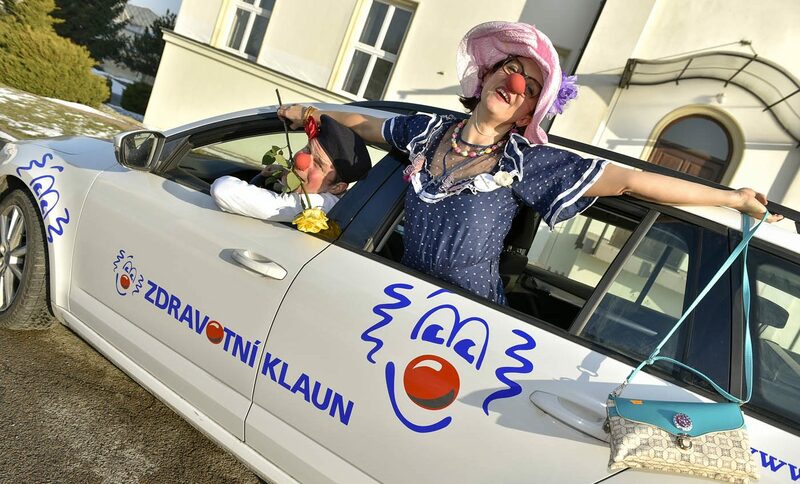 Fifteen minutes before two in the afternoon, the time has come for another meeting with the clown duo, Jitka and Roman. 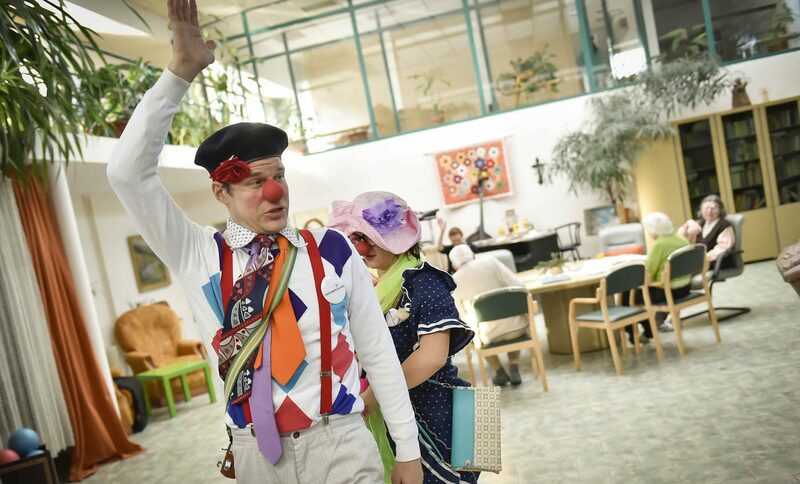 Dressed in somewhat bolder costumes, they are ready to pay a visit to St Charles Borromeo Day Care Centre for the Elderly in Prague’s Řepy quarter. In contrast to child patients who can “handle” a bit more, they need to approach with visibly more caution the door leading to the spacious, light, and airy day room. With a tremendous respect, actually. Even for a light-hearted, free-spirited clown, there are certain boundaries that simply cannot be crossed under any circumstances. Jitka and Roman enjoy doing this. In addition to the necessary respect, the word ‘esteem’ is used on many an occasion. Without these two cornerstone attributes the clowns would not be able to succeed in their efforts. 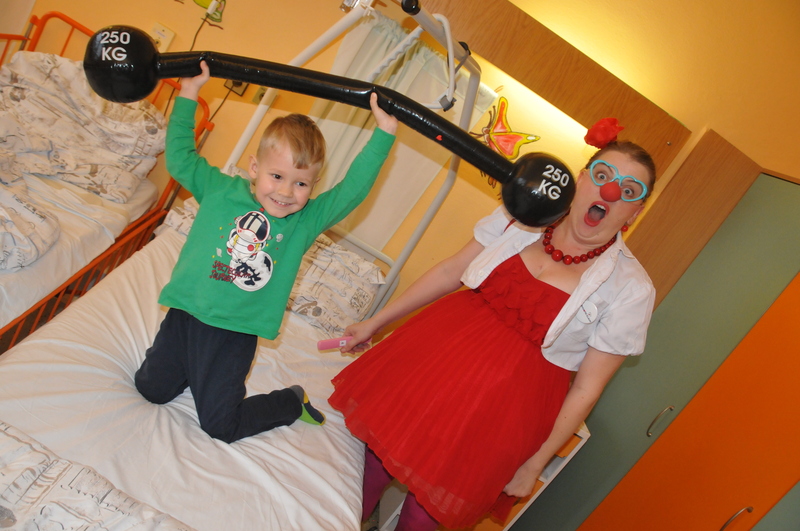 Jitka and Roman are slowly nearing the end of their performance for today at the Day Care. They’re preparing for one more visit – to patients who can no longer move about. The mood can shift diametrically, and the respect factor needs to be emphasized even more. The photographer and reporter stay outside closed doors, as their presence might upset the seniors’ fragile spirits, and that would be just the opposite of what the clowns intend. The bounds of sensitivity are extremely fragile in this case. Three men and three women are sitting around a large table in the day room. Some of them greet the clowns already from a distance. Wrinkled faces lighten up with contagious laughter. It is apparent that they’ve prepared themselves well for the clowns’ arrival. The proof can be seen in clothing that has been chosen meticulously, and in the men’s section faces are freshly shaven. The evident joy manifests itself by the warm hugs with which some older women greet the beloved red-nosed visitors. So far so good, the mood is excellent and the acting duo can start to dispense their doses of improvisation. Roman predominantly entertains the female part of the audience and, with the help of his ukulele, he starts singing hits that accompanied the youth of today’s seniors during tea and dance parties, or various gatherings. They start to sing along immediately, with slight memory hitches, which are overcome in a flash as soon as the audience recollects again. Jitka focuses her attention upon the gentlemen, showing them pictures from her very first date. Although they mostly tend to “their” groups, the clowns don’t forget to keep the dialogue between the men and women flowing. In this manner, the show is held together so that it does not break down into disarray and is able to keep the audience’s undivided attention. One cannot help but notice that the protagonists’ goal is to activate the memories of youth, the times when the seniors were happy, satisfied, and surrounded by their loved ones. These things are long gone for them in most cases. The clowns are, again, the only ones who may visit them from the “outside”. The clowns are always on the move, and sometimes one gets the notion that the seniors are having a hard time keeping up with them. But that’s just an illusion! The smiles very nearly set aglow the faces marked by all the difficult trials of life. The overall atmosphere is beautifully accentuated by the loud outbursts of exotic birds which the Day Care personnel cares for. 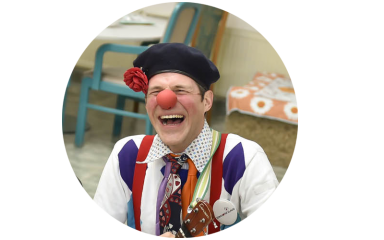 What drew you to the role of clowndoctor? Roman: We’re both actors, and I’m a teacher too. It’s another dimension of our work. I’ve been doing theatre for over 15 years, and I’m continually discovering myself through acting. The clown has always attracted me, and that’s the reason I’ve joined motion theatre – pantomime. I like this kind of acting. It’s a freedom of expression, but there nevertheless are firm rules. Plus, it’s the combination with pedagogics. I enjoy it a lot. Jitka: My motivation is a little different. What’s important for me is the overlap into the social sphere. It’s all shifted a level higher, specifically to a level that is helping people. Which visits are more challenging for you? 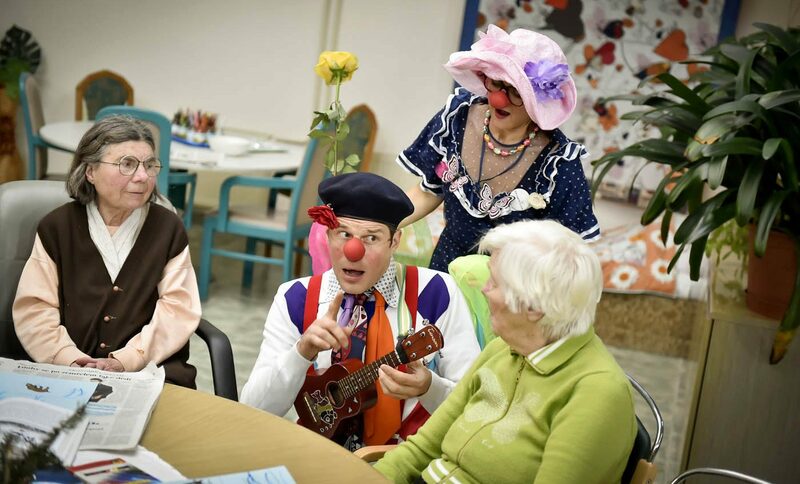 The children’s ward or the geriatric ward? 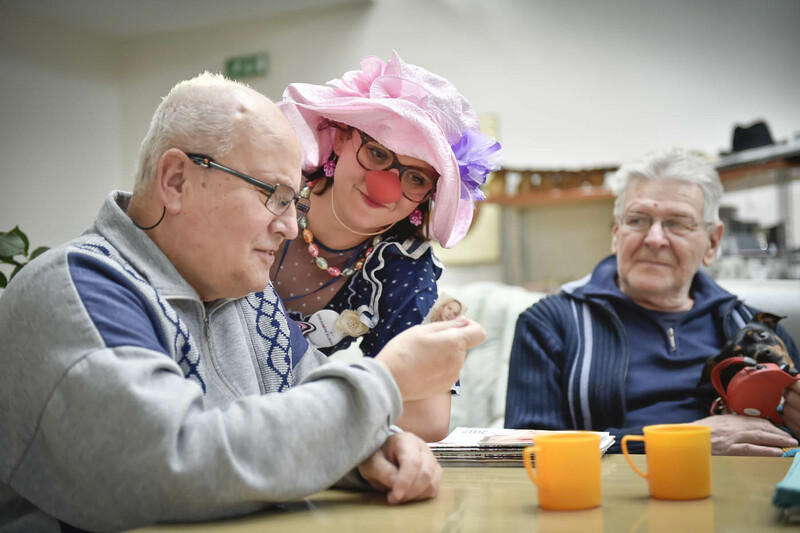 Jitka: For me, it’s the work with seniors. A huge dose of respect is needed, it’s more fragile. It unfolds differently, too. Bursts of laughter are more rare, the process is more poetic, it’s more about being soothing. Roman: Clowns and children simply go together. 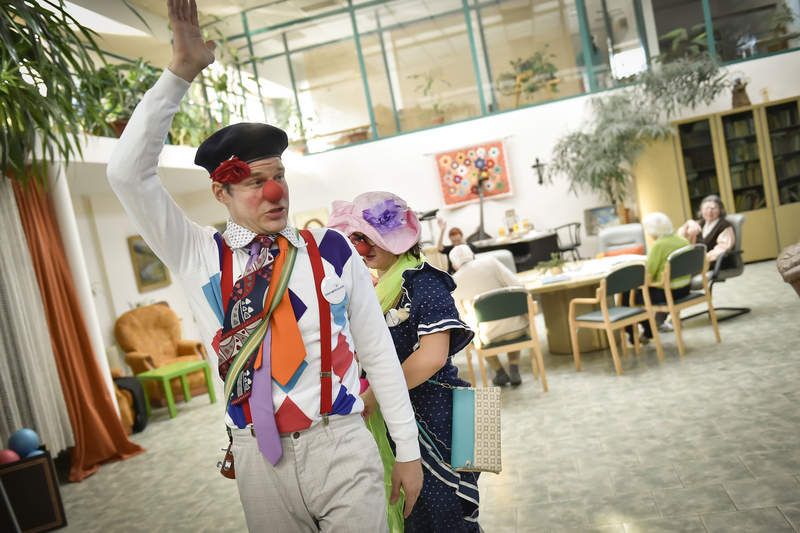 On the other hand, with seniors, the clowns can be perceived as something not quite appropriate. It’s tougher, but I really enjoy the geriatric ward. As soon as we achieve acceptance, from that point on the possibilities are limitless. That is fascinating for me. What is your way of coping with such a demanding line of work? Jitka: It is important to have psychological supervision, so that we have everything under control. What also helps is making time just for myself, to process everything, to analyse it and to work through it. Roman: I agree, having time just for yourself is important.